Early morning to Museum Island to see the Dom and Pergamon Museum, external viewing only. 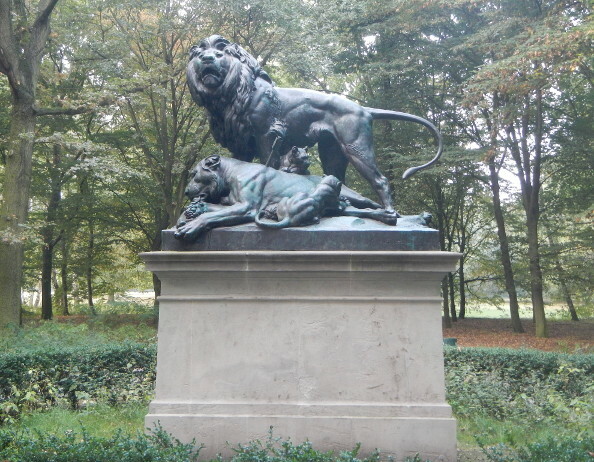 On the way back through the Tiergarten we found what appears to be the lion version of The Natural Family, cast in bronze. Mr Lion stands proudly above Mrs Lion who is lying, apparently contentedly, at his feet while two small cubs frolic. Closer inspection reveals that Mrs Lion has been deeply pierced by an arrow, an occurrence that would threaten the well-being of any NF. Anyway, we have been past this spot a few times since and there has been no visible deterioration, so we’d say her condition is serious but stable. Our travels of the day took us beyond the Berlin Wall Memorial, past monolithic factories of former decades, to Volkspark Humboldthain, a park with a peak that used to be a flak tower. It is covered in graffiti and rather unkempt, but provides good views to the north and west sides of the city. Then back past the Neue Synagogue (Moorish with impressive dome) to the Fernsehturm (TV Tower) and a fast ride to the top – 6 metres per second as we told more than once. Berlin looks very fine from on high. During evening aperitif hour we observed a Berlin woman of mature years and can now confidently state that it is ok to wear small polka dots with tartan and a slightly battered straw hat (fine straw tightly woven), and to ride on a seventies style hybrid bicycle. This entry was posted on 8 September 2014 at 6:00 pm and is filed under Europe 2014. You can follow any responses to this entry through the RSS 2.0 feed. You can leave a response, or trackback from your own site.